Brief Synopsis – A photographer with a broken leg spies on his neighbors while sequestered in his apartment and thinks he sees a murder being committed. My Take on it – I can’t explain why I have never seen this movie before. It has always peeked my interest and I knew the basic premise, but never had the chance top experience this masterpiece for myself. Finally, I can now say that it was worth the wait and the hype didn’t ruin it for me at all. 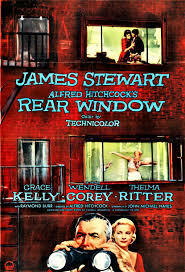 The entire movie is filmed from the perspective of a man “stuck” in his apartment who spends his days observing his neighbors who live in the surrounding buildings. Alfred Hitchcock filmed almost the entire film from that claustrophobic apartment and we as viewers get to experience everything the same way as star Jimmy Stewart does. We know only what he know and nothing else and that raises the suspense and the stakes that by the end we are on the edge of our seats demanding to know what is going on. Grace Kelly, Thelma Ritter and Raymond Burr are all superb here also! This is one of Hitchcock best movies and I’m very glad that I finally had a chance to seeing it. If you haven’t yet, I strongly suggest you do! Bottom Line – Excellent Hitchcockian thriller. Perhaps one of his best. The claustrophobic feeling really puts the viewer in the place of the characters. Highly recommended! and I appreciate that very much! Excellent summary of a brilliant film. I am glad you got around to watching it finally because like so many Hitchcock films it is superior enough to withstand any and all hype. You should! Try Shadow of a Doubt, Vertigo or even North by Northwest. You won’t be disappointed! Wanna know a secret? I haven’t seen this one yet. So you weren’t the only one who hadn’t gotten around to it! Lol. I really need to watch it though because it sounds great. And I do love Jimmy Stewart. 🙂 Great review! cant wait to hear your thoughts on it too!